Born fifth of the fourth fifty four, John Timothy Rothwell was the son of a modern-day warrior, 4546273, Sgt W L Rothwell, a Scouser in the York and Lancaster Regiment, (for was it not the sergeants that won the war for us?) and May Victoria (a Londoner named after two queens) Rothwell nee Barratt. Arthur (or John as he was then known) was born in Yorkshire and was raised in the shire of Hamp, being the garrison town of Aldershot. Although Sgt Rothwell is interred in Aldershot military cemetery under the above name what his original name was is unclear. Having run away from school - it was a good one, being approved – he then lied about his age, changed his name, joined the British army, corps of drums, and went to war. Arthur himself was the original boy named Sue, 1954 being long before the time of the scan, and was in fact to be called Susan Carol. Unfortunately, when he was born, he was discovered to be far too dangly to be a girl, and after a re-think it was decided to call him Timothy John. However, Sgt Rothwell’s commanding officer and his lady wife had decided upon this very combination for their own child born around the same time. Therefore, not wishing to be seen to copy, the young Arthur was duly named John Timothy, although, as we have heard, the Rothwell part of the name was highly dubious. From what Arthur has subsequently learned, it is likely that his father’s original forenames were Angelo Fritzgerrio, obviously not the ideal combination during the Second World War. Thus the young Arthur of indeterminate origins was brought up, an army brat (mongrel English). His mother’s line, however, is more traceable, and includes such personages as Blawe-Barret, the last English man to face Jack Johnson, the heavyweight boxing champion of the world. Having received a secondary education and leaving school at the age of fifteen without qualifications (although he later gained membership of Mensa), he got a job as a telegram boy. The adolescent Arthur turned into a “rebel with without a cause” becoming a time served nomadic biker chieftain - however as 24341883 1st battalion Royal Hampshire Regiment, Arthur received exemplary conduct upon discharge from Her Majesties forces. Before returning to the biker fraternity, Arthur was in fact a Minister in the Universal Free Church, holding the title of Reverend and the job description of Psychic Investigator. His interest in all things Spiritual began at the age of fourteen, whilst skiving school, when he and his father suffered a traumatic and near death experience in a train crash - the dustcart his father was driving was hit by a train. Following this, the young Arthur was then drawn to things of the occult, religion and philosophy, thus the beginning of his Druidic training. After diverse adventures and life experiences, it was in 1986 that he reverted to his once true and former name of Arthur Uther Pendragon. By Beltane of 1990 he had been hailed as the once and future king, Rex Quondam Rexque Futuris, and raised Honoured Pendragon, Glastonbury Order of Druids. 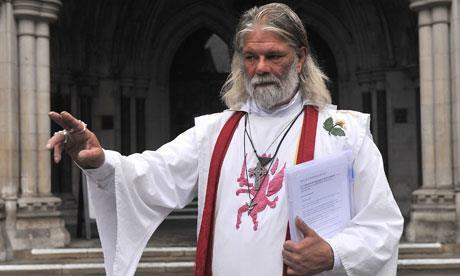 Since then he has received many titles from both the Druid and Wicca community and has steadfastly fought for Truth, for Honour and for Justice, campaigning both against the encroachment on our once green and pleasant land by developers, and for and on behalf of the civil rights movement. He views himself primarily as a Freedom Fighter with his reality being, that if we ever get it, Freedom that is, his work is done and he is out of here. He is presently known for his role as an environmentalist and Eco-warrior. What is not as well known or as publicised is the fact that he was the piling foreman on the Peterborough bypass and helped to run in a supervisory capacity a six and a nine million pound contract for Laing Management Contracting. Being sworn to the Sacred and Imperial Oath, he has run in General Elections, being the only Independent candidate to poll more votes than a national party. He has taken H.M Government to the European Court of Human Rights, and as Plaintive, challenged the Home Secretary in the Royal Courts of Justice. As defendant, he has appeared before Crown, Magistrates and County Courts against the forces of establishment. He will not shun his responsibility to challenge any Law that he and his Order see as unjust, nor will he or his Order shrink from fighting in any arena, whether it be it a Court of Law, in the pursuit of justice, an election, (through the ballot box) for general consent, or through the diverse channels of Druidry and Wicca. Thus, he and his Order take their vows seriously, and will live and, if need be, die by the sword - the sword in question being Arthur’s sword Excalibur. King Arthur Pendragon, is a Pagan Priest, and Druid Swordbearer, and takes (as do his Knights and Priestesses) their duties seriously. This means that he has an unshakeable belief in the Divine and his/and their place in this system. Thus it may be observed that he is at one - King, Arthur and Pendragon. What is best for the nation (Pendragon) must come first. What is best for the tribe (King) must come second and what is best for the man (Arthur) must come last. Thus as King, as Arthur and as Pendragon he must prioritise. Arthur, the man, is Pagan and has a belief in the twinning, being that of the Sun and the Moon, Male/Female, Druid and Wicca. That we can have one without the other is not within his belief structure. That the Female is the sisterhood is without doubt and likewise that the Male is the brotherhood is beyond question. That monogamy exists is up to the individual and not within his belief structure. “The only way I may make love to the Goddess is through her priestesses - each and every female is an aspect thereof”. Therefore when you hear “The Kings a Tart” it’s probably true. And it works for him. As King, Arthur believes paramount in the fellowship of the Table Round, it being a case of horses for courses. Arthur being the best God’dam’ Arthur we’ve got, simply because he is the only Arthur we’ve got, Parsley being the best Parcival we have for the same reason. Just as Gally and Daggers are the best Galahad and Daggonet we have for the very same reason. And like any cycle or chain. It is only as strong as its weakest link. Thus we all have a part to play and stand or fall as one. Thus is the nature of the tribe. A title given to an ancient British or Welsh Chief holding or claiming supreme power. In English, chiefly known as Uther Pendragon, father of Arthur. The word means “Chief Dragon” the dragon being the war standard. - The Oxford Companion to English Literature. As Battle Chieftain Arthur takes his role seriously and will do naught as either King or Arthur to jeopardise what is best for the Isle of the Mighty (Britain) and the common good. It is his belief that there are others at this time who have returned to fight and to lead the other nations. So too shall they join the fight and alliances be made for good to triumph over evil. Arthur’s work however remains here in the Isle of the Mighty.